Current mood = this super-catchy Bollywood song that I am OBSESSED with right now. Ahhh! Turn the volume up and dance! Carefree / bold / emotional / fearless / goofy / jumpy. And to extend my current mood, this dish has all the makings of a last-minute recipe idea. It has ingredients that can be easily found at any store, a method that is literally chop > season > roast > garnish (with candied walnuts!) > serve, and flavors that make it a melange of quintessential autumn-y, bold, yet warming & comforting notes that at the same time, never over-power any main dish you’d couple it with. 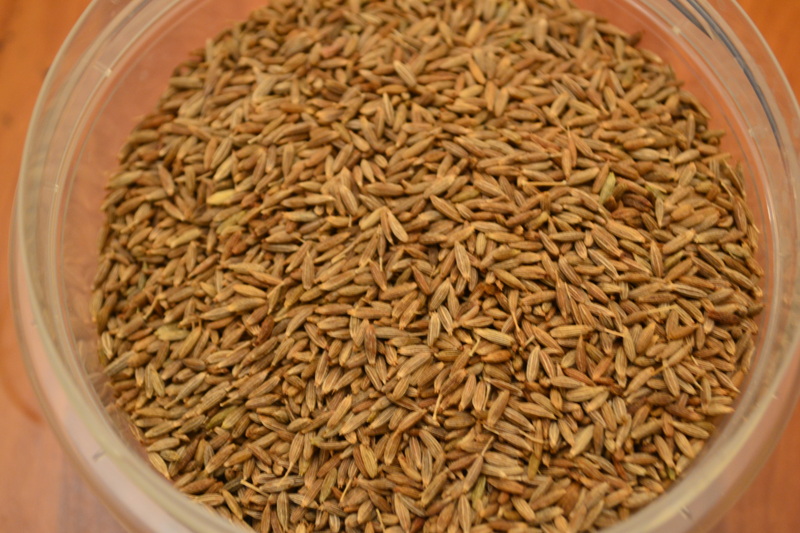 With brown sugar and cumin powder as some of the seasonings, I love that the spices I used are a fun blend of Indian and typically non-Indian flavors. Make it a topping to your not-so-boring desk lunch salad OR… make it a punchy side-dish to your upcoming Thanksgiving feast, or potluck dinner party! Invited to your to-be mom-in-law’s house and you want to impress her? Bring this dish. Invited to potluck with your new set of friends? Bring this dish. Invited to your boyfriend’s gracious and welcoming friends’ home? Bring. this. dish! This is my favorite – 1 tsp La Chinata smoked Paprika powder. Or, you can use regular paprika powder, or chili powder. Either will do. La Chinata paprika powder is THE BEST purchase I made at my recent trip to Spain. The paprika is the highest quality and the smoky flavor has amped up all my dishes lately. Yum! Unfortunately they don’t export to the States but I have enough of a stash to last me before my next trip to Europe. Set the oven to pre-heat at 375F. Use your biceps, triceps and forearms well to clean, peel, then chop the Butternut squash in 2 inch cubes with a good sharp knife. If the idea of cutting up a squash stresses you, get the already chopped up variety from the store. I usually find them too small-cut, so I prefer doing my own prep. Nifty tip: After cutting the squash in manageable chunks, I pop them in the microwave for upto 2 mins. This softens them and makes them easier to peel. Make sure you let the squash cool before handling! In a large bowl, add all the olive oil, spices and seasonings, and mix well. Then pop all the chopped squash in it, get your hands in, and mix everything really well to make sure every piece is coated with the oil and spice mixture. Prep a large baking sheet and line it with aluminum foil. Spread the squash evenly, without crowding the pieces. Use another tray if needed. Then bake in the 375F oven for 30 mins or until all the squash is cooked. If you like yours more crunchy, continue to bake on 400F for another 5 mins to get a golden-brown color. Empty the cooked squash into a serving dish. Then garnish with any spicy or lightly candied walnuts. I used the lightly flavored walnuts from Trader Joes. Serve and enjoy! Look at that. 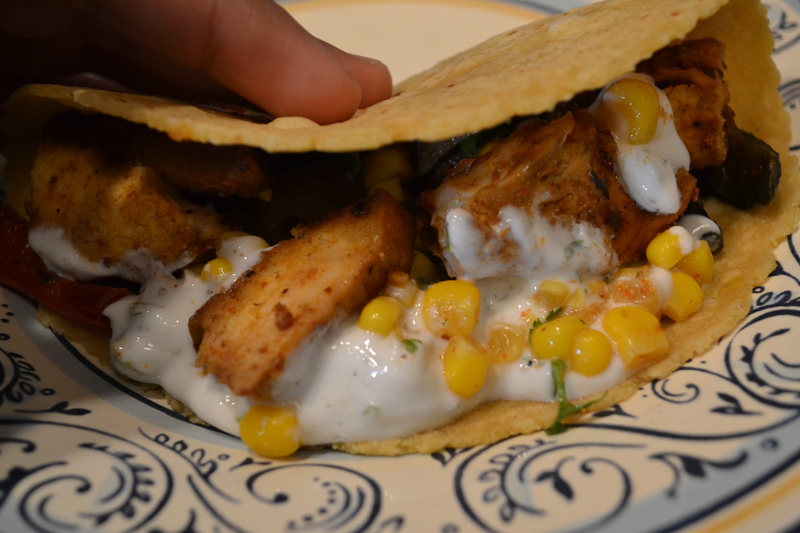 A warm, freshly prepared, spicy, yummy, piled-with-tons-o-flavor Chicken Taco. Isn’t she lovely? Did I just give this taco a gender? I ate her. And another of her folk. And another later that day. I came up with this recipe when I invited my sister and her family over recently for lunch. The occasion? My fabulous new digs! I wanted to show off my new place in Saint Paul to the people who matter most, and in my typical I-want-to-impress-my-sister style, I scoured Pinterest for new recipes I could impress the sistah with. Despite my well-intended planning, I missed getting the groceries beforehand, and scrambled to get what I could find at Trader Joe’s the day of. 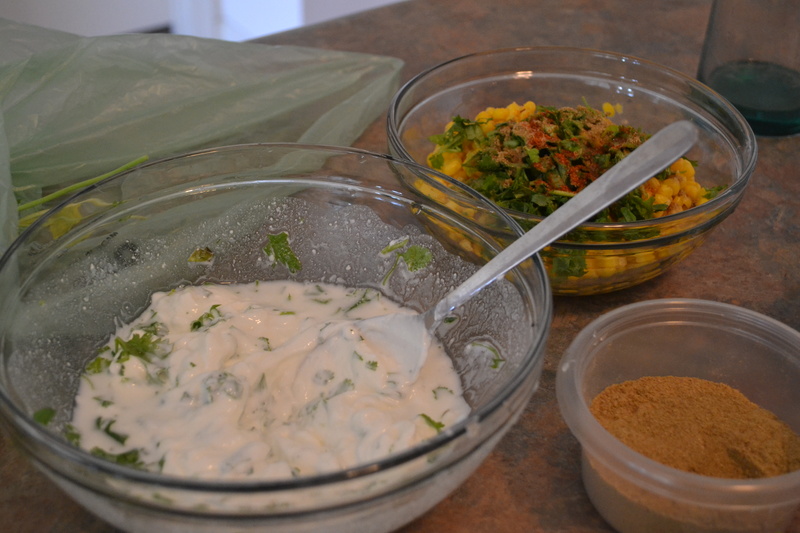 I also managed to make the taco low-fat by using no cheese, a spiced greek yogurt topping instead of sour cream, and a yummy no-oil corn relish that I spiked with some Indian masalas. Glee to the mouth, I say! The multiple textures made for a delicious and satisfying meal. The recipe needs a few different steps, but with some simple multi-tasking, you can easily prepare it in a little over an hour. Clean and wash the chicken breasts. Pat dry. 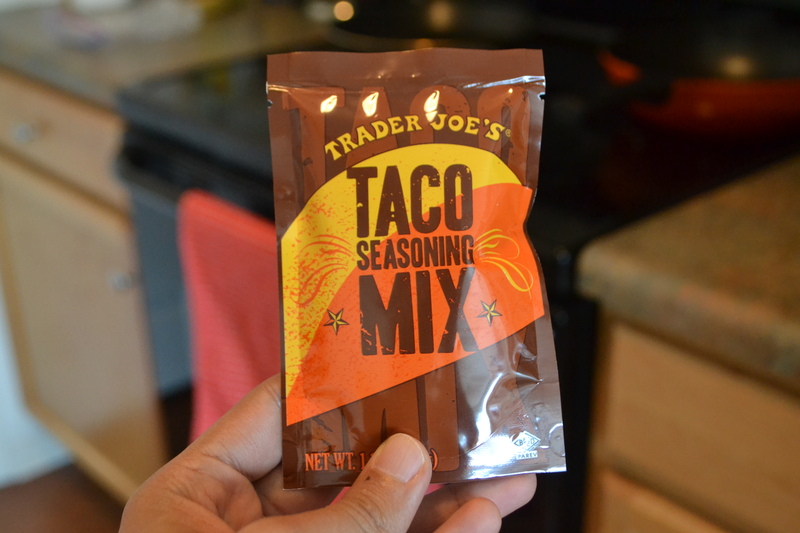 Place in a large bowl with 1/2 a pack of the Taco seasoning, and mix well with your hands. Make sure you get the spice over all the chicken. Set aside. 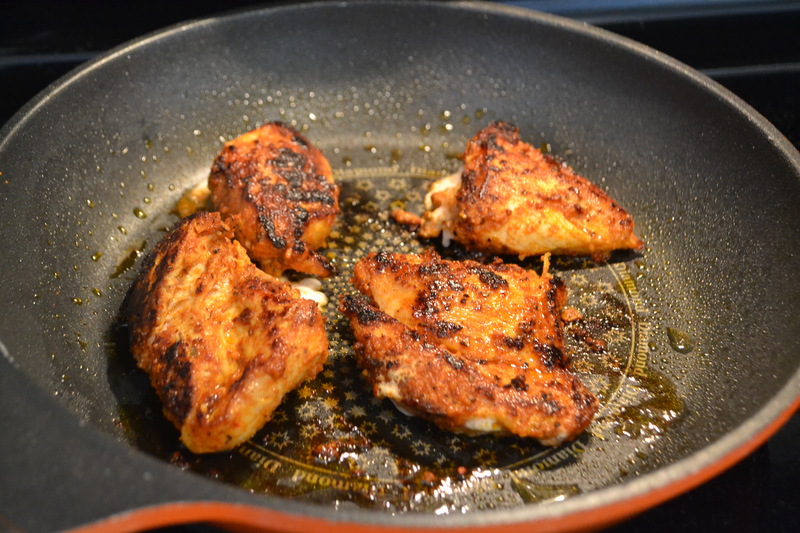 Once the chicken is seared from one side, flip over, allow to sear, then lower the hear to low-medium, cover with a lid, and let the chicken breast cook through – 7-8 minutes. 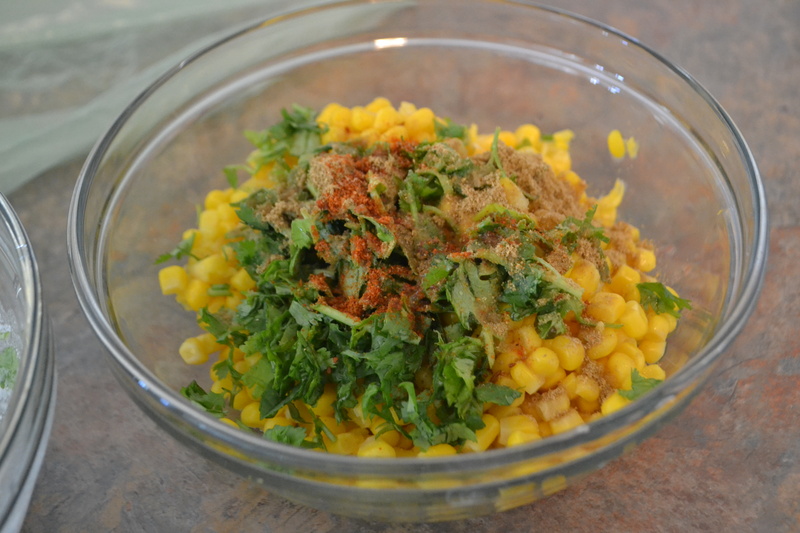 For the corn relish, place the sweet corn, a handful (5-6 springs) of chopped cilantro, 1/2 tsp of cumin powder, 1/2 tsp chili powder, juice of 1/2 lime, and salt to taste. Mix well. 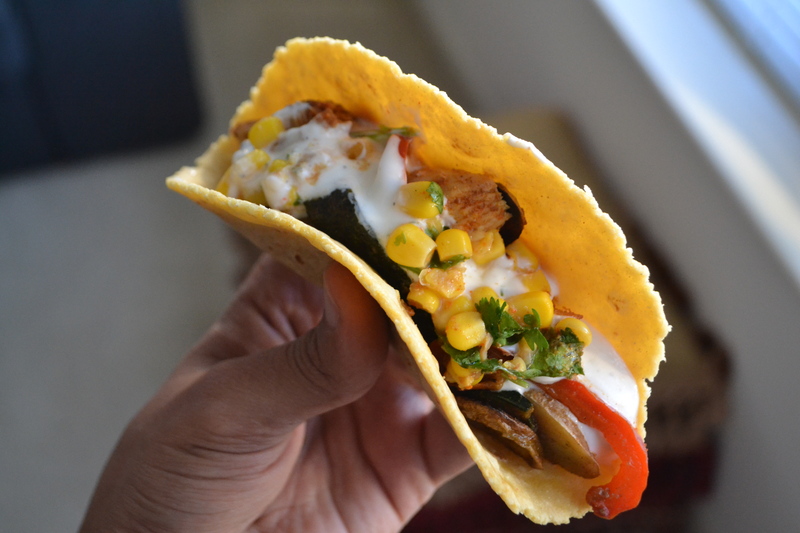 You could serve the taco as is, with the chicken and toppings. 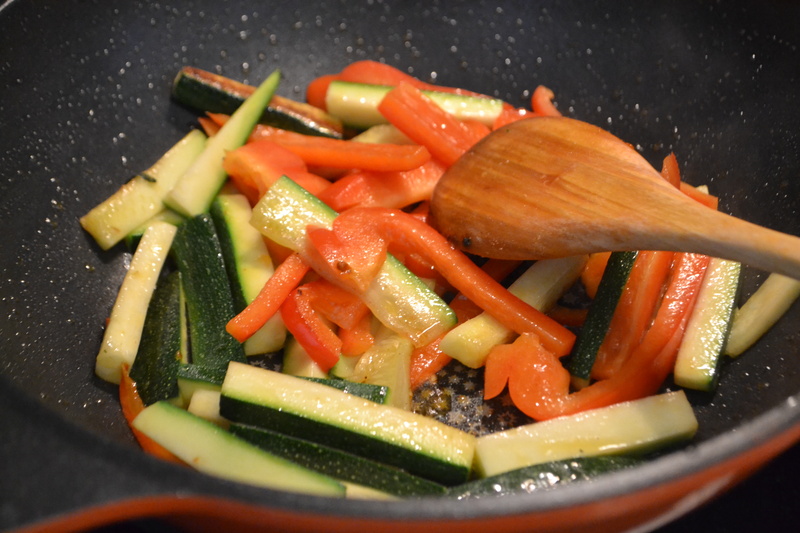 However I wanted to add some more crunch and sauteed a whole bunch of vegetables in olive oil, salt, pepper and oregano. And that’s it! Now it’s time to serve. Wrap up your tortillas in a clean kitchen towel, and microwave for 30 seconds. Serve fresh with all the components, and enjoy! 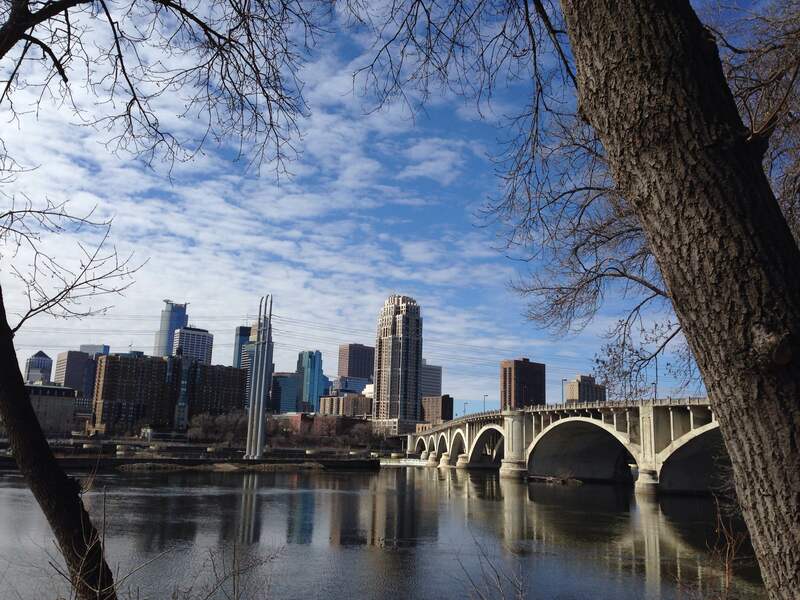 A view of downtown Minneapolis from the St. Anthony Main neighborhood. Spring is here in it’s full leafy, fragrance-of-the-grass, sunny glory here in Minneapolis, and everyday I walk out of my home and marvel at the fresh air, the sound of birds chirping, and the cool (not freezing) breeze on my face. Spring has this quality of making me feel refreshed and renewed every year. The long winter here makes me crave for this season and I cannot believe it is finally here! Spring also, at least for the last couple years, makes me introspective about how far I’ve come. Perhaps the new buds and leaves on the trees remind me about the progression and growth of life. And my own progression. 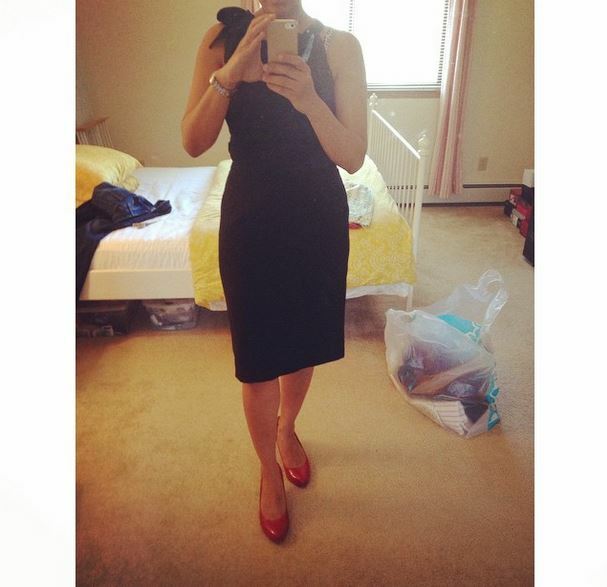 It is co-incidental because this May marks 3 years since I’ve been divorced. When I sat down one evening a few days ago in my little red armchair in my apartment, I had a smile on my face as I reflected on my experiences these 3 years. How much have I done, and seen and experienced! And I know that I would have never, ever experienced these things, with the energy, honesty, openness and joy that I did, if I was married to the person I was. In so many ways I am thankful I experienced what I did. And thankful to him. 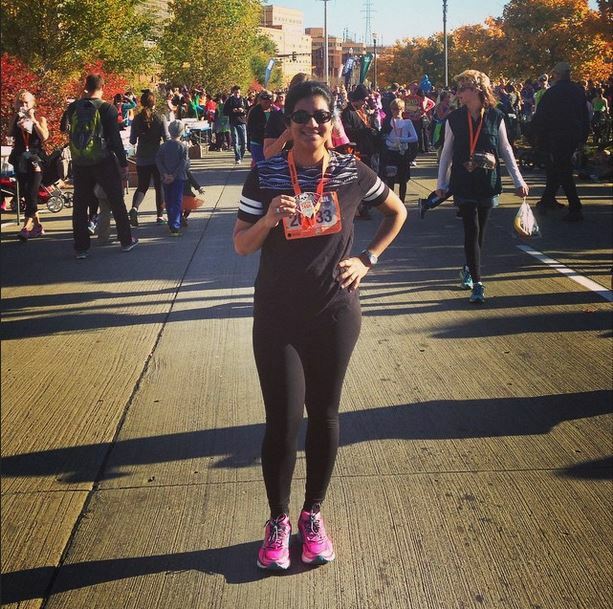 It was meant to be, and only in feeling like I had nothing, like I was incapable of having or feeling anything, was I driven and motivated to accomplish, feel, accept, be strong, defy, exert, experience, celebrate, express, and be the person I’ve always wanted to be on the path of becoming. It is an incomparable feeling that I am so grateful for finally acknowledging. And so, I celebrated last weekend with a few friends. And we did what we do best. Get goofy, make jokes we shouldn’t, stay out too late and laugh too much. (PS. The shrimp steamed buns at Moto-I are fab!!). After a night of indulgence, I needed something fortifying in the morning. 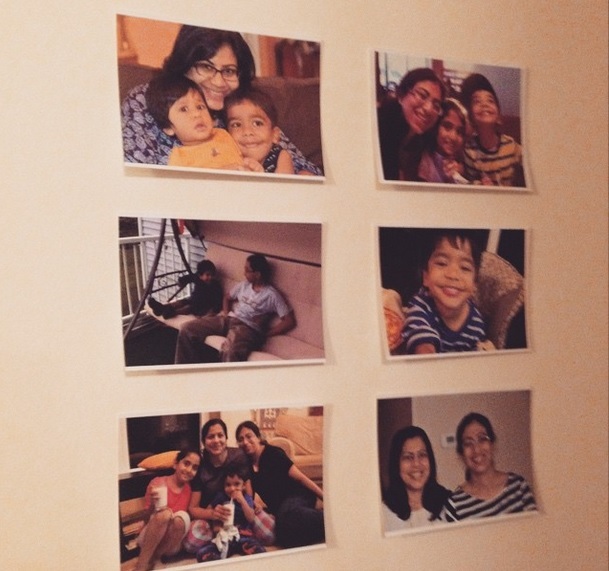 And what better occasion to make it than Mother’s Day, for a dear friend and mom! 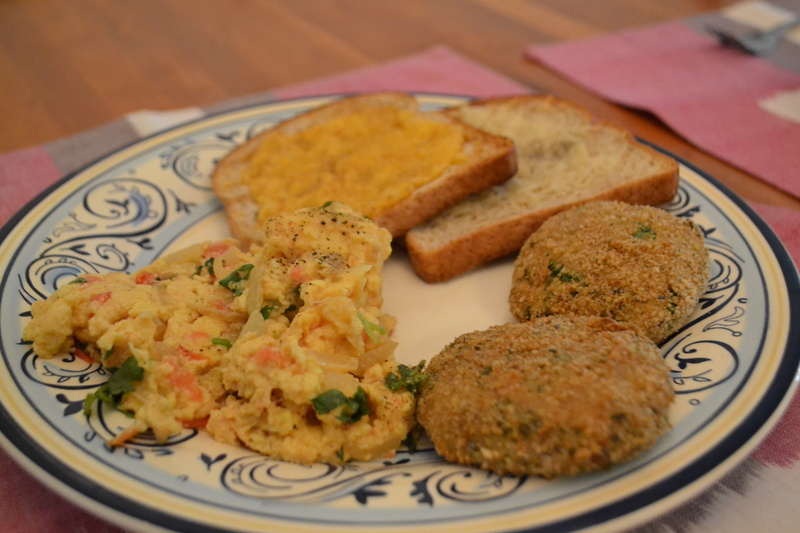 I had her over for breakfast and decided to treat her to my favorite style of eggs – Bhurjee, Bombay style. 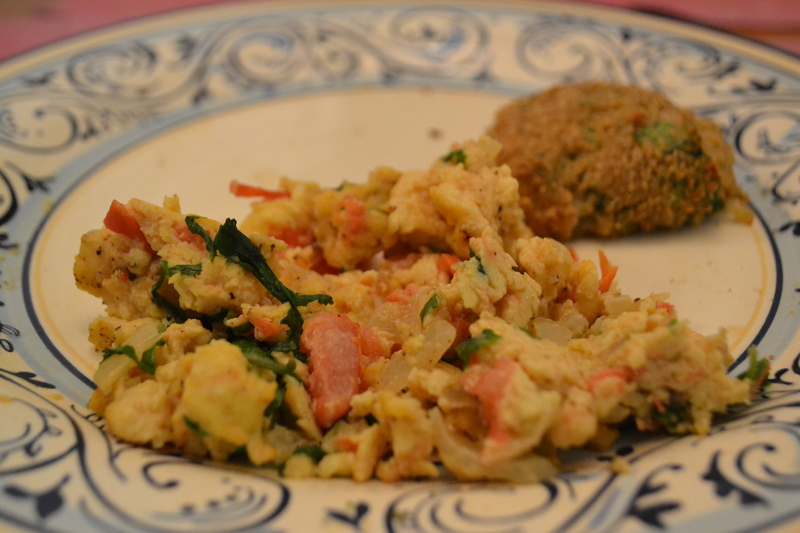 Bhurjee, to the best of my knowledge is a breakfast preparation that originated on the street food stalls of Bombay. The low-cost eggs, coupled with a few simple vegetables and spices, makes a satisfying and inexpensive meal for laborers and office-goers in Bombay. I remember going to one such street stall for a late night meal after several hours of partying when I was in college (shhh… don’t tell mom I did this 😉 ). It is all together, warming and completely satisfying. Coupled with hot charred pieces of bread, standing by Marine Drive, with the smell of salt in the air, bhurjee can feel like an adrenalin shot when one is tired. Crack open the eggs in a bowl and beat very well with the milk. In a non-stick pan, heat the olive oil and sautée the onion on medium heat until slightly brown and translucent. Then add the tomatoes and cook until softened. Add all the spices except for the black pepper, and salt. Mix well, and slowly pour in the egg mixture. Turn heat to medium-low. With a spatula, keep separating the cooked egg from the bottom of the pan and keep enveloping it in the raw egg. Make sure you keep the heat to medium-low to ensure soft eggs. 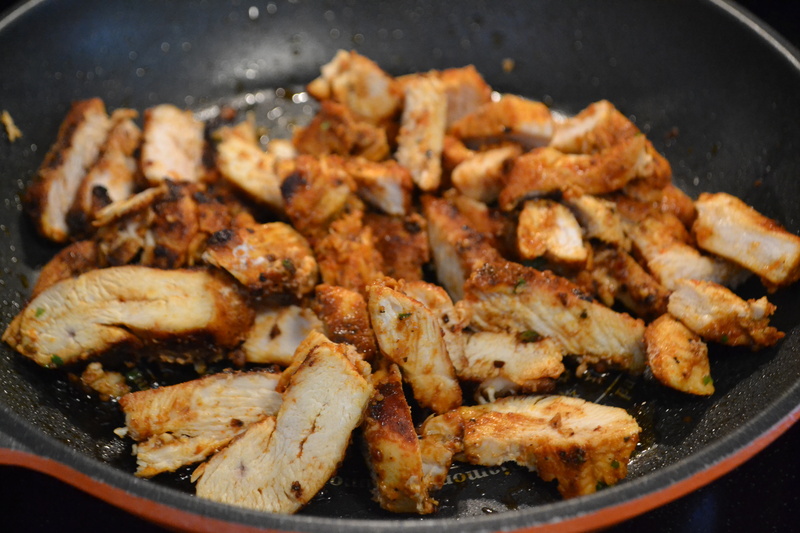 Once cooked, turn off heat and mix in a sprinkling of black pepper, and the chopped cilantro leaves. Serve immediately with hot buttered toast or charred buttered bread. There are many recipes I have created in my little apartment kitchen over the years, that have the unmistakable SABERA stamp on it. The unmistakable Sabera stamp means it is a recipe that is simple, yet layered with many interesting, opposing, yet complimentary flavors. Easy to make, yet conveniently also easy to adapt to my changing moods, preferences, and um… grocery availability in the fridge, or lack thereof. Also, QUICK. This last piece is very important. I’ll tell you why. Cooking for one (myself) is a true art form. I’m being sarcastic. 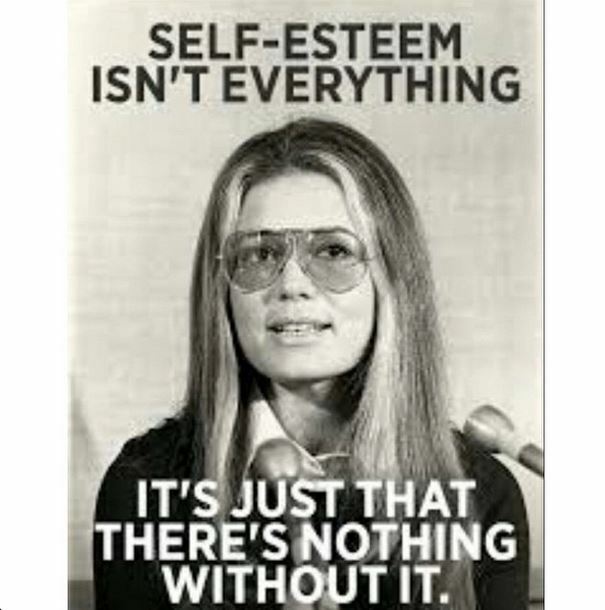 But truly, for me it’s something I’ve taught myself over the years. My schedule, like so many of us, is very hectic and investing too much time in the kitchen to cook a meal is a luxury I no longer have. More importantly, one must also keep some time aside to do the dishes ( 😦 ), which is why total time invested in the kitchen must be planned to be at a minimum. Hence, the need for a quick recipe, that also doesn’t fail to tingle not just the tastebuds, but also the home-longingness senses. SO! 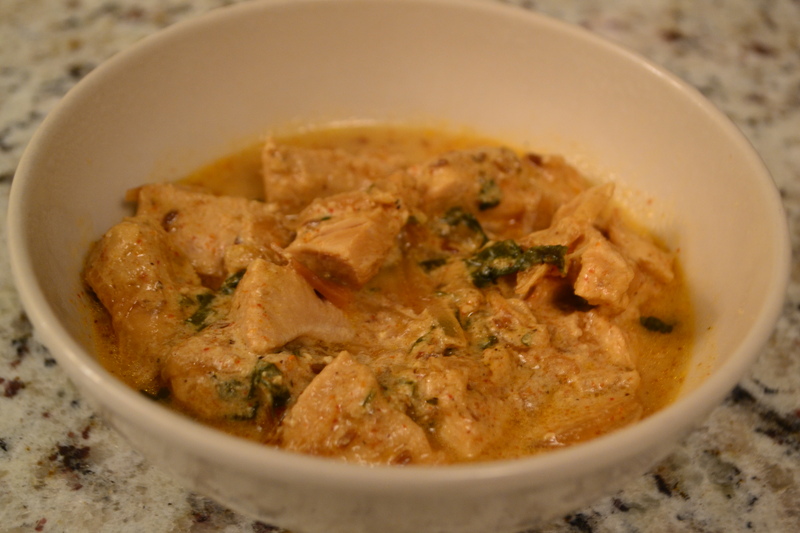 Today I’m going to share my super duper easy peasy chicken-curry-in-a-hurry recipe. And when I say hurry, I MEAN it. This recipe takes under 30 mins! Yes! No gimmicks! 1 cup plain yogurt – if using greek yogurt, use 1/2 cup and dilute with 1/2 cup water. It helps to use slightly sour yogurt. Check to see if the chicken is cooked. 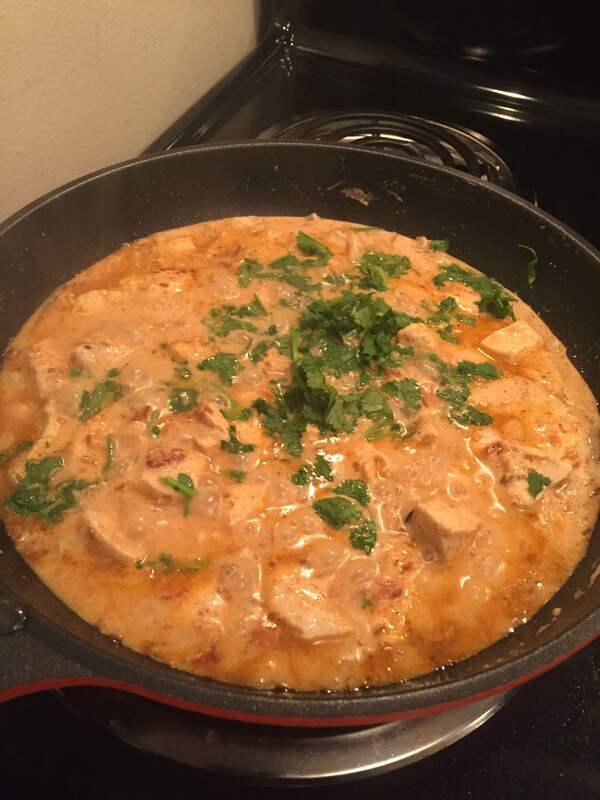 Turn off heat, add the chopped cilantro, mix well and let the curry sit in the pan with the lid on for about 5 more minutes. 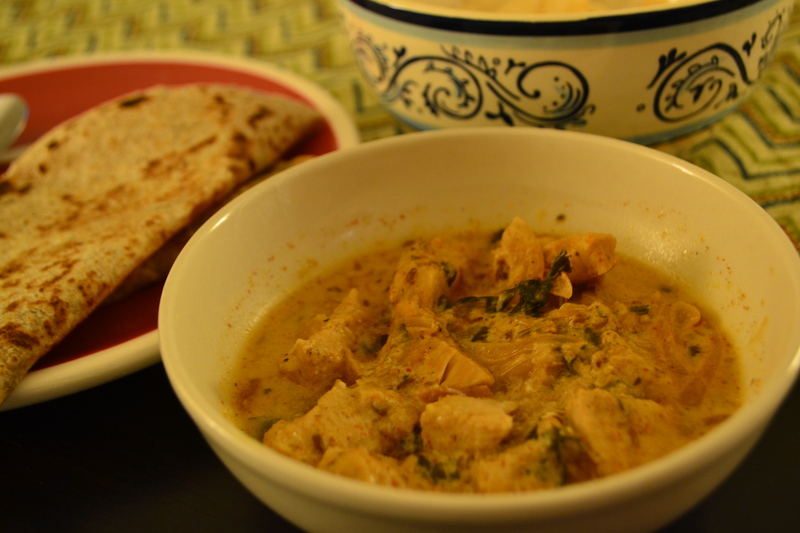 Serve fresh with hot Rotis, or rice! Hello folks! How was the weekend? Hectic and productive, or lazy and relaxing? Or something in between? Either way, I hope you feel energized to tackle a brand new, glorious week! Many friends have asked me about my recent juicing habit, why I do it, benefits, and most importantly, RECIPES! 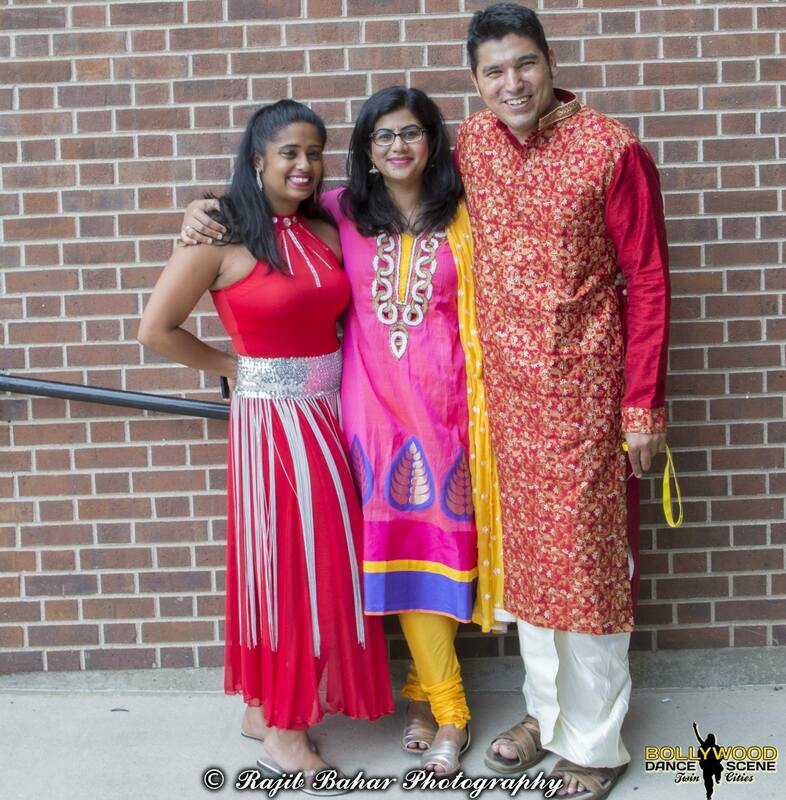 Before I share 2 of my fave juice concoctions, I want to give a special shoutout to the Bollywood Dance scene Twin Cities and a hobby I have been nurturing for the last year or so – Bollywood dancing! 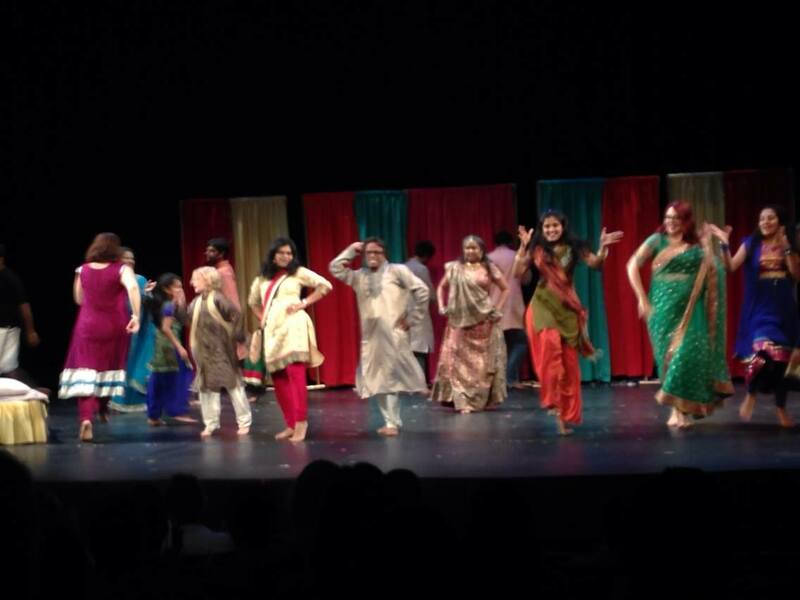 Over a year ago, I went to this Bollywood dance class here in Minneapolis on a Thursday evening purely on a whim, and since then, have met some incredibly talented, amazing people, many of whom are now close friends. 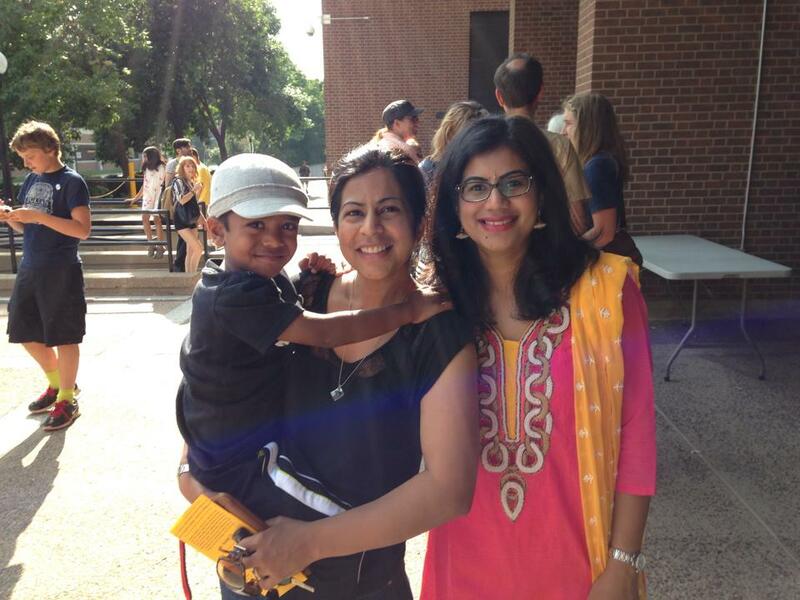 Since then, the Bollywood Dance scene Twin Cities has become a dominant Bollywood dance center in Minneapolis-St.Paul, and they even put up the VERY FIRST Bollywood-themed play at the Minnesota Fringe Festival in 2014. I had the privilege to act and dance in this play last year and had an absolute blast! I never really saw myself as an actress or dancer but Divya Maiya – one of Bollywood Dance Scene’s lead choreographers convinced me to act and dance. What started as a side project in the summer, bloomed into something that was helping me see myself in a completely different way. I could see that over time I had fewer inhibitions; I was less self-conscious after multiple sessions of practice in front of a critical audience. Being around an accepting, fun, goofy group also helped me embrace that aspect of my personality – something that I always felt awkward showing or being comfortable with. 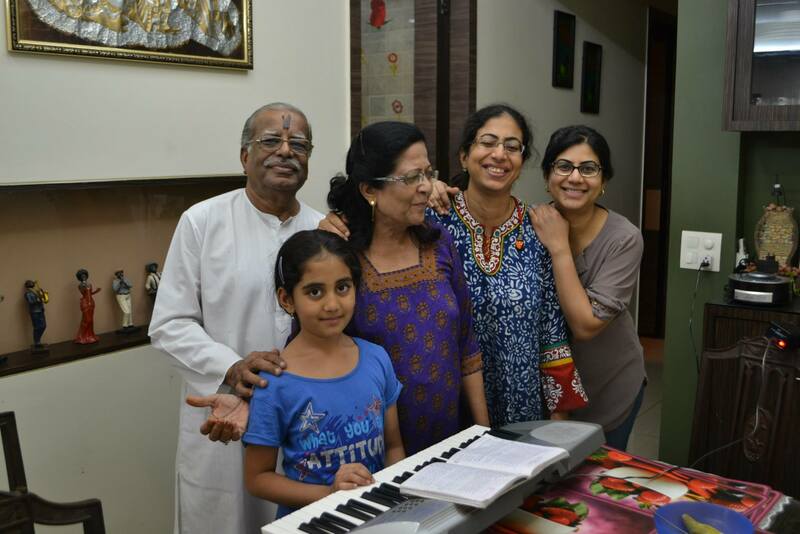 I cannot emphasize how crucial this group, and specifically Divya and her talented husband Madhu have been in helping me through this journey of self discovery and learning. PS. In case you want to watch the play, view it here! It’s under an hour and I promise you will have a lot of laughs watching! 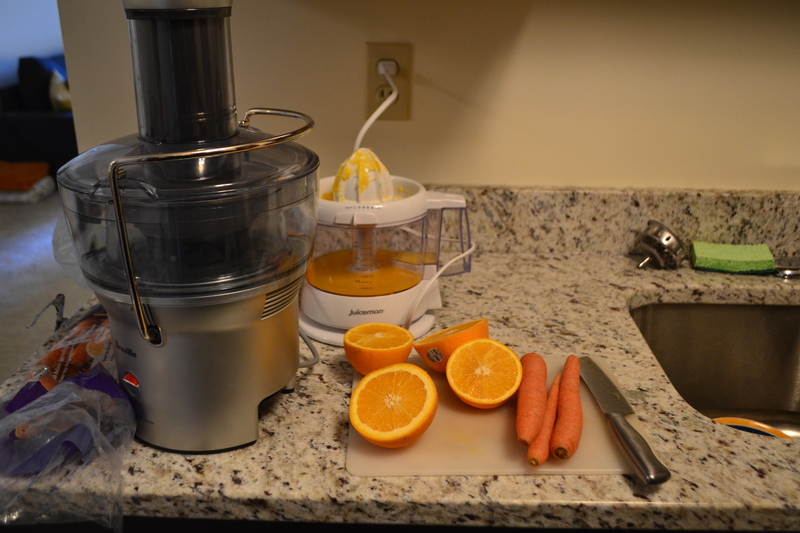 My juicing appliances – The Breville Juice Fountain Compact juicer, and my Juiceman Citrus juicer. First off, I should say that I am not obsessive about juicing nor do I do extreme ‘cleanses’ that involve only drinking juice for days. I have found that these extreme techniques don’t work on my body and doing things in moderation help me the most. Currently, I drink a glass of juice about 2-3 times a week, as a snack. Since I’ve begun juicing, I feel that my skin has cleared up, so less acne, my digestion has been easier, and I have fewer hunger pangs at odd times of the day and night. 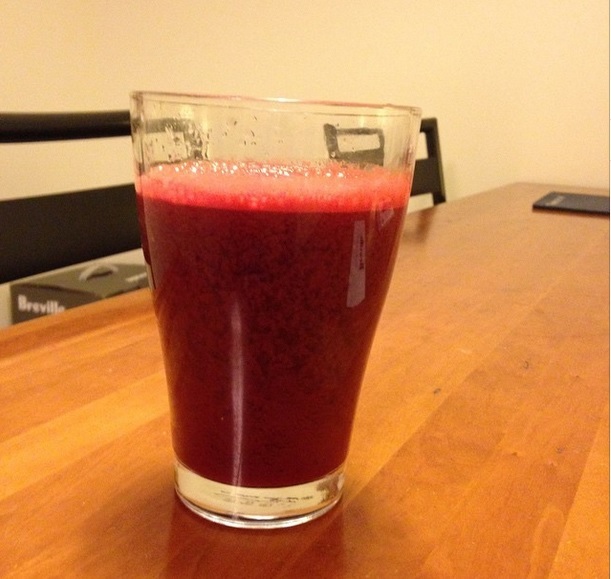 The days that I drink a glass of juice, I also feel energized and less sluggish in the afternoon hours. You must wonder what appliances I invested in. I did a little research and learned that Breville had the best offering in juicers that juiced vegetables as well as several fruits. Their lowest priced product – The Breville Juice fountain compact juicer – was affordable (under $100 from Amazon on Black Friday), and sturdy. I already had a citrus juicer that I bought for a pretty affordable price online, so adding the Breville helped me get started with juices that combined vegetable and citrus juices. Let’s talk recipes! Instead of following what I got online, and to make juicing count for me, I started by figuring out what my body needed the most. I have always had low iron, and typically have a Vitamin D and C deficiency in the dark, long winter months in MN. So I knew I needed to find juices with high iron, Vitamin D and C. The following are 2 recipes I currently follow. Be sure to use organic vegetables as much as you can, and wash thoroughly before juicing. Please also be sure to check if you have allergies to any vegetables or raw food. This recipe is super simple. 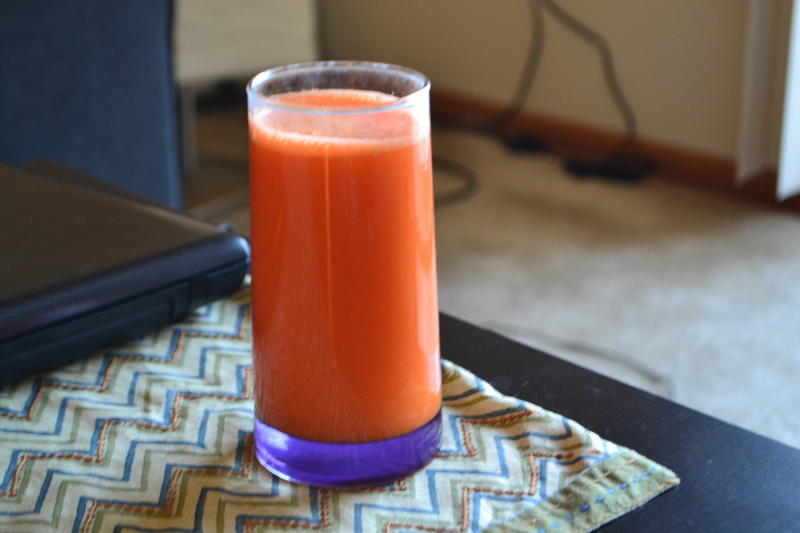 To make juice for 1 person, you need about 2 large carrots, 1-2 oranges, and a 1 inch piece of ginger, peeled. Extract the citrus juice with a citrus juicer. Juice the carrot and ginger in a vegetable juice. Combine the 2 juices and drink immediately. I really like this juice because it has Kale, a vegetable a don’t eat much of in its normal form, and Beets, which are full of Iron. For 1 glass of juice, I use 2 carrots, 2 large leaves of kale, 1 apple, and a 1-inch piece of ginger. I wash all the veggies and apple, peel the ginger and juice it in the Breville. I then add a squeeze of 1/4 of the lemon. Lemon helps Iron absorption from green leafy vegetables. You could use spinach if you find Kale to be too bitter. I hope you enjoy juicing as much as I do. 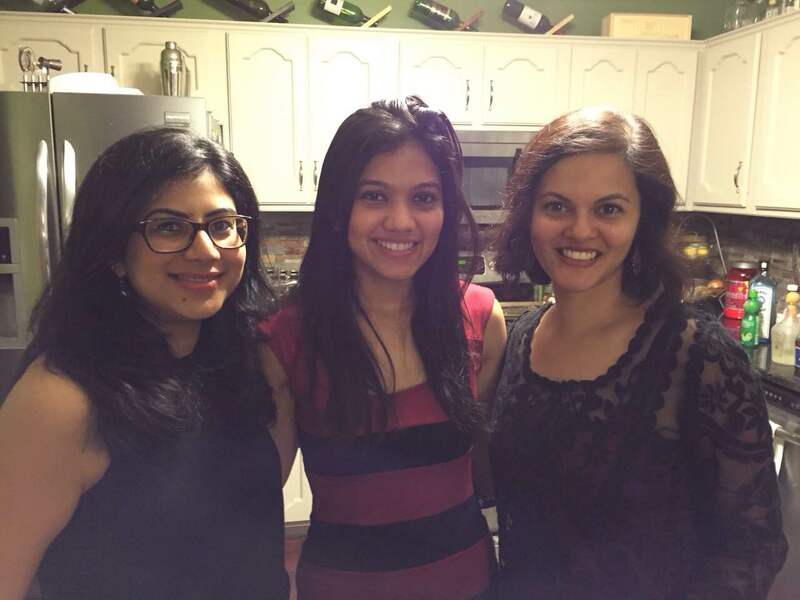 And if you live in MN near the cities, do give Bollywood Dance Scene – Twin Cities a try! Have great week, folks! 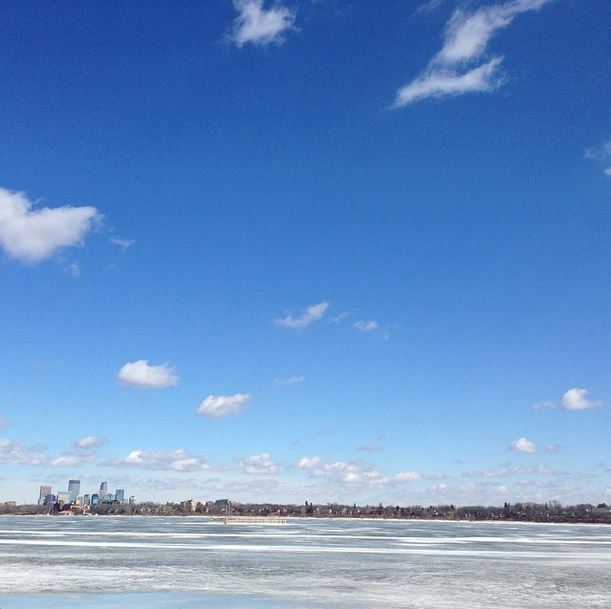 It’s another BEAUTIFUL day here in Minneapolis! We’ve been having a few un-seasonally warm days (hoping this doesn’t jinx it!) and today, when the temps got to as high as 63F, a few friends and I decided to do a little fire and dinner outside. 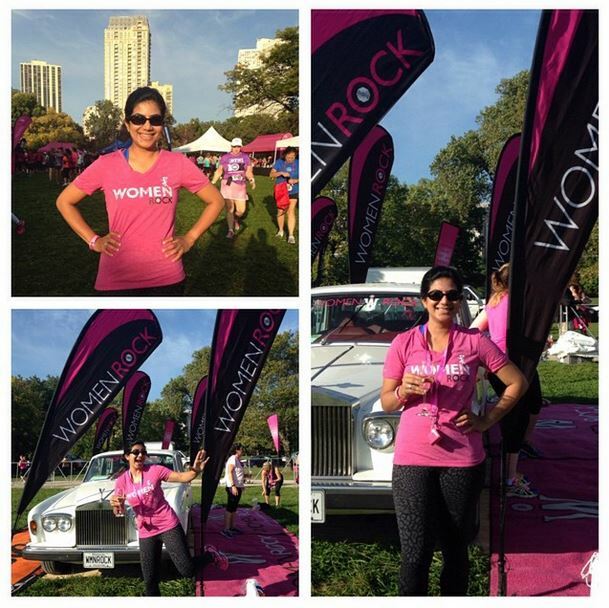 It felt SO wonderful to enjoy the fabulous weather and sunshine! We were talking about the relationship we have with our parents and one of my friends was telling us how everyone in his family misses his late mother so much. They all feel a deep void in their lives and they miss the love she freely and generously gave to them. He shared that today would have been her birthday. I’ve had many conversations with this friend about his mother, and today really made me think about how she must have affected her family’s lives. My career has moved to a place where I am working much longer hours because I truly and thoroughly love what I do and want to exceed every expectation I have from myself. But I thought about what my daily life and activities lead up to. Not career-wise. But broadly in my life. Pardon me as I spell out my existential crises 😉 But don’t you wonder whether people will remember you when you leave? How will I be remembered? And who will miss me? What impact am I having on the people who matter? I’m not sure I can say that my influence on any one person today has been sharp enough to warrant a deep longing for me, if I ceased to exist. Perhaps it’s even selfish of me to think this way. We all want to be needed and missed. I don’t know the answers. I do know that now, I’m not sure if I’m doing everything in my power to be the true and best me to the few people who matter in my life. And I’m not sure how to. 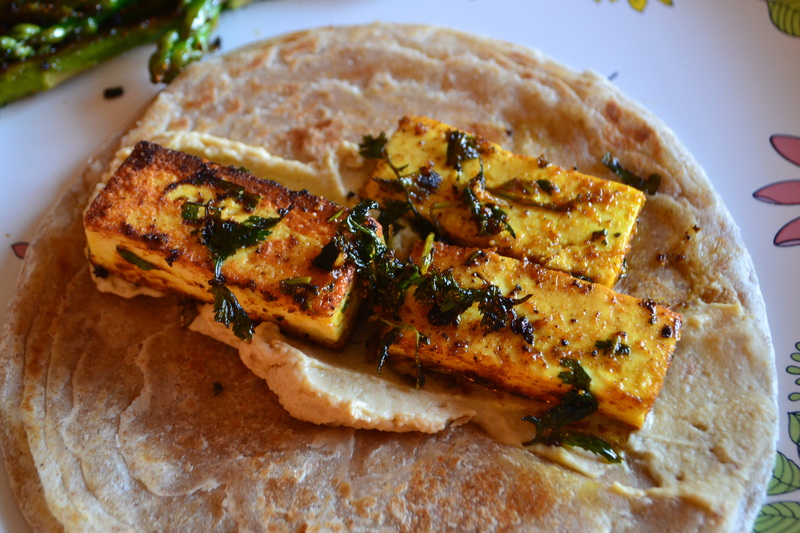 Easy, weeknight dinner – Paneer (cottage cheese) and roti (flatbread) rolls. I checked the fridge and found a gorgeous hunk of Paneer (Indian cottage cheese) I had picked up from the desi grocery store. I knew I also had some hummus I made the last weekend, and some frozen whole-wheat roti or Indian flat bread. I proceeded to cube the panner in large, slim hunks, and then ‘marinated’ them in 2 different spice mixes, lemon juice, and some chopped cilantro. I grilled them in a little oil in a frying pan. 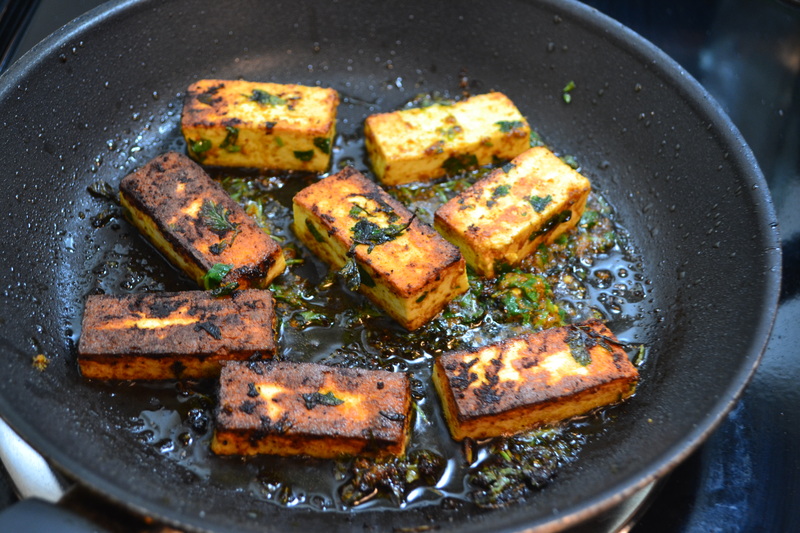 The paneer grills pretty quickly! 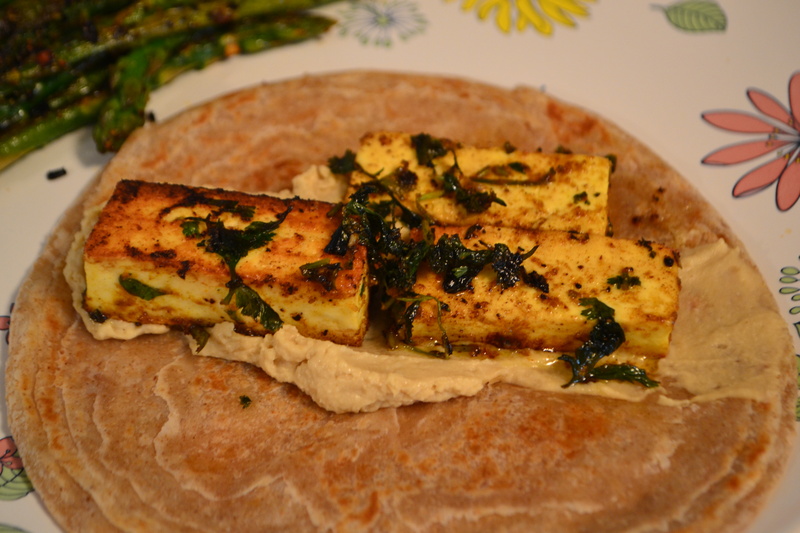 Once crisp on all sides, I heated up some flatbread, then spread a dollop of hummus, arranged the paneer, rolled up the flatbread, and voila! I had a yummy, high-protein, low-fat, low-sodium, high-on-flavor dinner. Recipe below! – Heat the flatbread in the mean time. 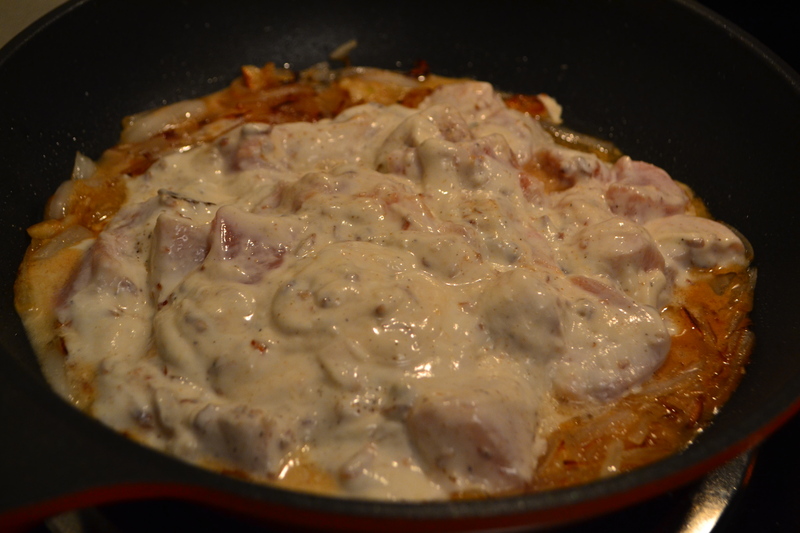 When cooked, spread a dollop of hummus across in the middle. 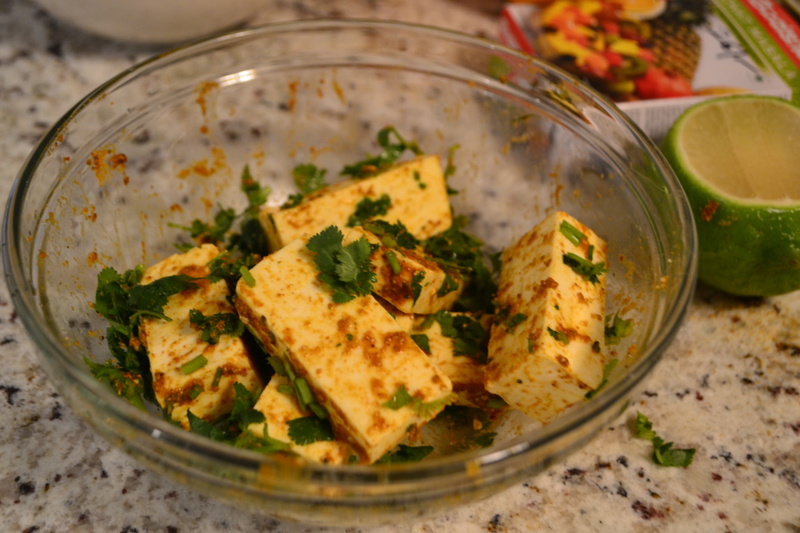 Place the hot paneer pieces. Roll the flatbread, and eat! You could add a cup of plain greek yogurt, or some grilled veggies on the side of your meal.